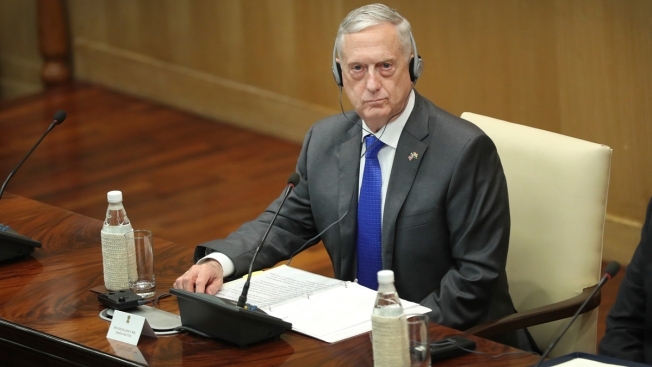 U.S. Defense Secretary James Mattis, U.S. listens the statement of Indian Foreign Minister Sushma Swaraj after the so-called "2+2" talks with US Secretary of State Mike Pompeo, and Indian Defense Minister Nirmala Sitharaman in New Delhi, India, Thursday, Sept. 6, 2018. Pompeo and Mattis held long-delayed talks Thursday with top Indian officials, looking to shore up the alliance with one of Washington's top regional partners. U.S. Defense Secretary James Mattis arrived on a surprise visit to Afghanistan's war-shattered capital on Friday, the U.S. command in Afghanistan said, just days after a suicide bomber killed 21 people in the city and wounded 90 others. Associated Press writer Munir Ahmed contributed.